"In a world environment when terror and despair disturb countless thousands, peace has become an increasingly rare and precious goal. More and more people across the boundaries of race, colour and political conviction see the need for peace as the only way to progress both individually and globally". With this as a back drop Dr. Lean Madesin Phillips in St. Louis, Missouri, USA formed an association for women called 'The Association of Business and Professional Association in 1919, Within 11 years it spread to sixteen countries and upgraded its status to The Federation of Business and Professional Woman in Geneva, Switzerland. BPW International has worked closely with the United Nations since its inception. It is one of the pioneering women's organisations to hold Category One Consultative status with the Economic and Social Council of the United Nations and its Agencies. The Organisation has permanent representatives at the United Nations which has played a major role in four world conferences on women. Mrs.Janaki Gunawardena, a reputed entrepreneur in Sri Lanka, who pioneered and introduced ' suspended ceilings' to Sri Lanka, established the Business and Professional Women Sri Lanka fifteen years ago in June 1993 and linked it to the global BPW. 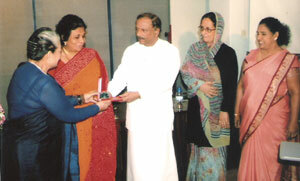 As the Chairperson of the Women's Chamber of Commerce in Sri Lanka at the time, she convinced Mrs. Savithri Jayasinghe (Former General Manager of Bank of Ceylon), Mrs Ajitha Kadiragamar (daughter of the late Minister of Foreign Affairs Lakshman Kadiragarmar), Mrs. Metta Kodikara and Mrs. Olivia Weeraperumal to set up the Association. Initial meetings were held at Mrs. Gunawardena's residence, subsequently the official inauguration of the Association took place in the presence of a house full of audience with then Foreign Minister Harold Herath and the Head of the UN Mission in Sri Lanka, Robert England at the Grand Oriental Hotel, Colombo. Over the past fifteen years BPW Sri Lanka has conducted seminars, workshops on various themes, taken delegations to World Congresses, Published booklets, launched books written by members, organised exhibitions, craft bazaars, career exhibitions, bridal shows for the underprivileged young women and provided access to credit. BPW SL has also conducted Health Camps for the poor and needy. 2003 was a significant year for BPW SL when it launched the first ever Global Peace Village in the world concept from Illukpitiya, Pollonnaruwa. It was executed as part of the Rehabilitation and Resettlement to bring relief to thousands of war victims in the border villages that had become displaced. BPW SL undertook the project in collaboration with Ministry of Rehabilitation and Resettlement. The Government provided 250 acres of land to be used for the construction of houses and agricultural purposes on its first stage of operation, the BPW SL constructed 150 houses during their stage. Following their footpath few other organisations expanded the construction with approximately 500 more houses in the area. BPW SL has a target of building 200 more houses in the very near future under their Stage 2 programme to be handed over to displaced war victims in border villages. Out of a contest of 85 country projects BPW SL received the 'Best Project of Excellence' Medal and a Certificate from the BPW Global which was personally brought to Sri Lanka for presentation by BPW Global Asia Pacific Coordinator Ambica Sehtra. As a member of the BPW Sri Lanka, opportunities are open for any woman to develop leadership skills and to advance her career and opportunities as much as to meet and establish new friendships through the organisation's network of affiliates. BPW SL's other objectives are to stimulate interest in Urban, Provincial and Municipal affairs and to lobby Government through ministerial and other Boards on current issues important to women, the economy and peaceful stability of the country. On 4 November 2008, members of the BPW Sri Lanka met to appoint a new President to concentrate on the association's activities in the future. Following a candle lighting ceremony the founder of the BPW Sri Lanka Mrs. Janaki Gunawardena introduced Mrs. Nadia Azath Sally and handed over the Insignia of Office to the new President of the BPW SL. Mrs. Gunawardena addressing the audience of members and guests gathered on this occasion gave a brief account of how the BPW Sri Lanka was formed with five close friends out of her sheer indomitable courage when many of her professional colleagues were either half hearted or unconvinced of the benefits to Sri Lanka women out of such an organisation. However, seemingly many professional women were convinced and much had been achieved over fifteen years, the pinnacle of which was to earn a Project Medal of Excellence out of 85 country performances. Introducing Nadia Azath Sally as the New President, Mrs. Gunawardena wished her success. The new President promised to continue with the good work in the future with innovative ideas in close cooperation with the Ministry of Women's affairs and by expanding the membership. Minister of Women's Affairs Mrs. Sumeda Jayasinghe giving a brief history of the progressive work done by the Association for the past fifteen years wished BPW SL success with a promise to extend the fullest cooperation and support to the BPW SL's future programmes. The Founder of BPW SL, Mrs. Janaki Gunawardena, organises a momentous alms giving annually (on 21 December) at her Boralugoda Walawwa to feed 200 urban and rural people. An open invitation is extended on this occasion to BPW SL members and their friends, who are willing and able to participate in this offering, to fill a bucket full of dry food rations worth Rs.2500 to be distributed to the folk after feeding them, which is seen as the BPW SL's highlight of the festive season.